With a stay at Konansou in Fujikawaguchiko, you'll be a 2-minute drive from Mt. Kachi Kachi Ropeway and 7 minutes from Fuji-Q Highland. Featured amenities include complimentary newspapers in the lobby, luggage storage, and a safe deposit box at the front desk. A train station pick-up service is provided at no charge, and free self parking is available onsite. Located in Kobe, Arima Onsen Gekkoen Korokan (Ryokan) is on a river, within a 5-minute walk of Arima Hot Springs and Kin no yu. Free valet parking is available onsite. When you stay at Seoto Yuoto no Yado UKIHA in Hita, you'll be steps from Ryukyu Islands. A train station pick-up service is provided at no charge, and free self parking is available onsite. 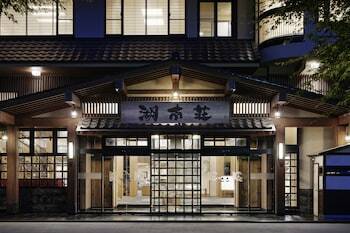 With a stay at Ichikawa Grand Hotel in Ichikawa, you'll be 7 mi (11.2 km) from Tokyo Sky Tree and 10 mi (16.2 km) from Sensoji Temple. With a stay at this vacation home in Kyoto (Central Kyoto), you'll be a 4-minute drive from Nijo Castle and 9 minutes from Kyoto Imperial Palace.